Four men have been arrested after a serious sexual assault in Cheltenham. 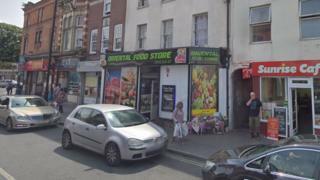 Gloucestershire Police said the attack took place on the town's High Street between 0430 and 0630 GMT on Saturday. They are particularly keen to talk to a man and woman who were outside the Oriental Food Store and helped a distressed woman. Two of the men have been released on police bail while the other two have been released without charge. They are all from Cheltenham. The two men who were released on police bail and are due to return to a police station on 28 April. Police would also like to hear from anyone who was in the area of the lower High Street between 0330 and 0630 GMT on Saturday.